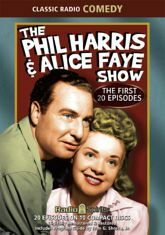 So Frankie Remley asked Phil Harris�and they'd soon find out, kicking off a memorable run of The Phil Harris-Alice Faye Show. The Rexall years marked the peak of the program's popularity, and the laughs come thick and fast! Join Phil, Alice, Elliott Lewis, Walter Tetley, Robert North, and the whole gang for the first twenty surviving episodes of the 1948-49 season. Savor the sarcastic wit and wisenheimer sensibility of these inaugural broadcasts -- featuring outrageous schemes, special guest appearances by Jack Benny and Fred Allen, fancy parties, Gale Gordon's first turn as Clyde Scott�and inevitable catastrophe.